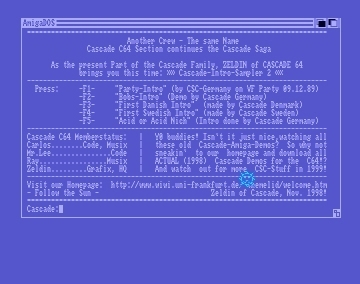 "Packdisks" are collections of different stuff, mostly intros and demos, sampled together on an Amiga disk and equipped with a simple loader menu. 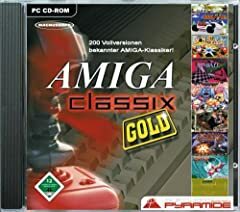 Because of their easy usage (no need to run CLI/Workbench) these packages have been quite famous on Amiga back then and likely spreaded and collected. 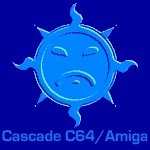 The Packdisks here are released under the flag of Cascade, though some of them might contain a collection of stuff, that is not inevitably made by Cascade members. 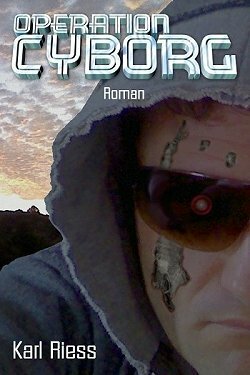 Packdisk, sampled by Nick and Zaxxan containing demos/intros by Mute 101, Prologic and Paradox. 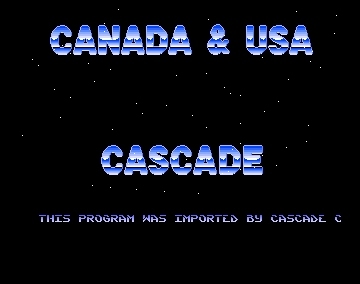 The according Cascade intro can be downloaded separately here. 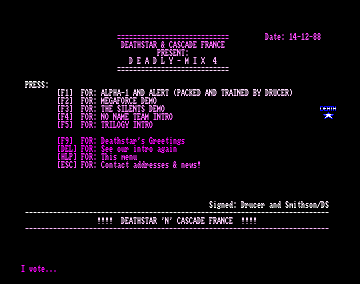 Packdisk, sampled by Nick and Zaxxan containing demos/intros by Share and Enjoy, Rebels, Kefrens, Deadlock, Advance and Savage. 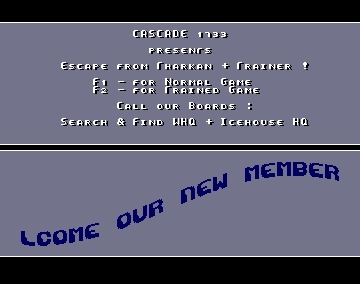 The according Cascade intro can be downloaded separately here. 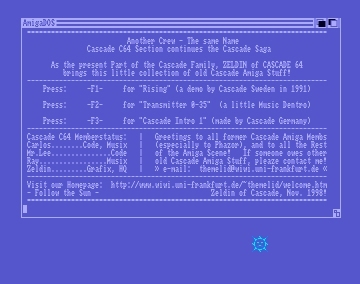 This Packdisk contains a collection of game docs, made by diverse ppl. 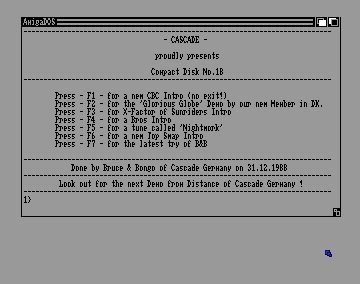 It also includes the Cascade dentro Rising. 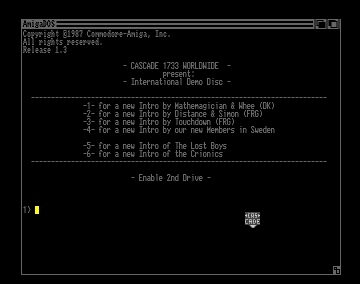 Packdisk containing several demos/intros from Cascade, The Lost Boys and Crionics. 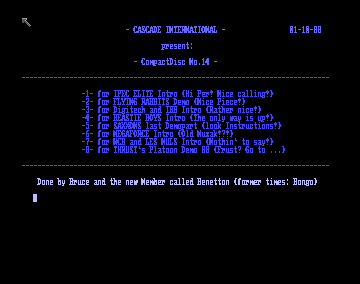 Sampled together by Simon and Ronny presumably (until further notice) in 1989. 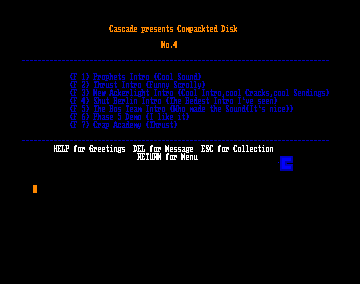 Packdisk, sampled by Bruce and Bongo containing demos/intros by CBC, Sunriders, Bros Top Swap and furthermore a demo by Bruce and Bongo and a first appearance from Mathemagician and Embeepee for Cascade Denmark. 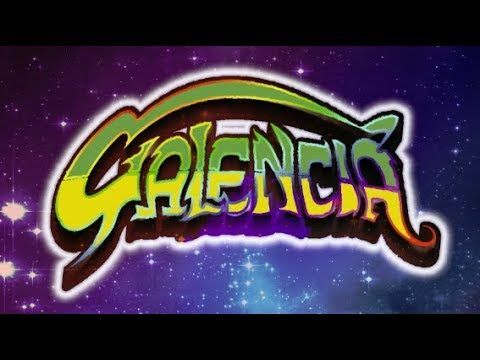 Packdisk, sampled by Bruce and Bongo containing demos/intros by Beastie Boys, Digitech & Italian Bad Boys & The Link, Ipec Elite & Ocean, Megaforce, Saxxon, The Flying Rabbits, Thrust, Les Nuls & West Coast Boys. 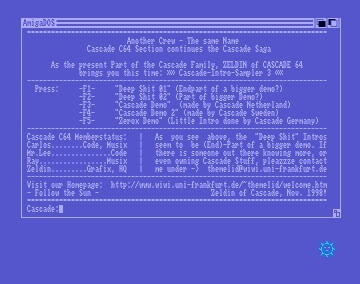 Packdisk, sampled by members of Cascade Germany containing demos/intros by Prophets, Thrust, Ackerlight, Shut Berlin, Bos Team, Phase 5 and Crap Academy. 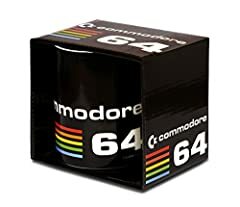 Release date is estimated, due to date of latest added file on the disk.